Chechnya has a storied history of insurgent activity and radicalization. Over the past five years it did seem to be receding into memory – there was a dramatic decrease in overall violence in the North Caucasus due to numerous factors, including extremist emigration to Syria and destruction of militant networks in the region. However, this trend appears to be reversing in the Chechen Republic. In 2017, the number of victims of armed conflict in Chechnya grew by 74% over the previous year, by far the greatest increase anywhere in the region. 2018 has been marked by long periods of calm punctuated by intense bursts of violence, most notably the four coordinated attacks on police officers on August 20, apparently committed entirely by teenagers. While the organized insurgency in Chechnya has been dismantled, violence and radicalization have not, instead shifting to a more spontaneous form that in some ways poses a greater challenge than previously. The armed insurgency in Chechnya evolved out of the various armed formations active in the separatist Chechen Republic of Ichkeria in the 1990s. After the region was conquered by the Russian armed forces in early 2000, militant groups withdrew to the southern mountains and shifted to guerilla warfare. While they remained potent, these groups were steadily degraded over the following decade, even as the insurgency spread to neighboring areas of the North Caucasus under the banner of the Caucasus Emirate (CE), declared in 2007. The situation became particularly dire in early 2012, when Russian and Chechen loyalist forces began a crackdown ahead of the 2014 Sochi Olympics. It was at this time that many Chechen militants and recruits began to leave to fight in Syria instead, with one commander stating that fighting in Chechnya itself was ‘1,000 times harder’ than waging jihad in Syria. An estimated 600 to 1,000 men left Chechnya to fight in Syria from 2012 to 2017. Meanwhile the top echelon of CE was shattered. Following the death of CE leader Dokku Umarov in 2013, the group’s subsequent leaders were killed in quick succession, with no successor announced to the last known leader, Zalim Shebzukhov, who was killed in August 2016. In fact, the last coordinated insurgent action of significant scale in Chechnya was the raid into Grozny in December 2014. Even the self-styled Islamic State made no headway. A branch named Wilayat Kavkaz was established in 2015, but it too was quickly degraded. While these developments seemed to mark the end of the organized insurgency, they did not herald a halt in violence. Violence in Chechnya has continued, but its characteristics have changed. Whereas militant attacks were once larger coordinated actions, they now consist of groups of two to eight young men who decide to attack security forces of their own volition. The attack on the Naurskaya National Guard base in northern Chechnya in March 2017 exemplified the new form of violence: eight young men, with no training or previous combat experience, attacked the facility in a crude manner, killing six soldiers and losing six of their own. They were initially armed only with knives, which is also a growing trend as contemporary militants make do with far fewer resources than in the past. The factors that drive radicalization and militant recruitment in Chechnya have also shifted to a degree, while retaining some older features. Persistent abuses by the security forces are another key factor. Chechen leader Ramzan Kadyrov regularly humiliates those who criticize his rule, forcing some to appear nearly naked on state TV as they beg for forgiveness. For a strict honor-bound North Caucasian society like Chechnya, humiliation of this kind is often intolerable, as are the collective punishment strategies and abuses of female family members conducted by the regime. The promise of glory on a Syrian battlefield also holds a particularly high draw for Chechens, who are revered for their fighting skills and discipline, to the degree that some non-Chechen Russian-speaking foreign fighters have adopted the nom du guerre ‘al-Shishani’ (Arabic for ‘the Chechen’) in the hope of achieving greater respect among their peers. Recruitment narratives directed at Chechens by extremist groups primarily focus upon the destruction of their homeland by Russia and the ‘infidel Kadyrov,’ often referred to in jihadist circles as ‘Kafirov,’ a play on his name using the Russified form of the Arabic word for ‘infidel’ (kafir). For example, a recent nine-minute video release by Jaysh al-Muhajireen wal-Ansar, the Russian-speaking contingent of Hayyat Tahrir al-Sham, devoted a lengthy section to addressing Kadyrov’s crimes. 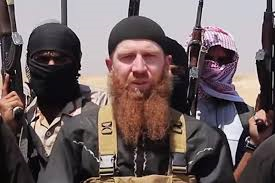 For their part, the most prominent remaining independent Chechen commanders in Syria, Muslim al-Shishani and Abdulhakim al-Shishani, call upon Chechens at home to bide their time at present. Muslim in particular released a video in mid-August calling on Chechens not to ‘throw their lives away’ in pointless attacks, but rather ‘make preparations’ for the right moment. With the situation for Chechens in the Chechen Republic becoming ever more difficult and repressive, it seems almost certain that violence and radicalization there will increase as young men feel ever more helpless. Some simply flee – the number of Chechens seeking refuge in Europe is now around 100 per day, and many of them make dire threats against Kadyrov. The spontaneous demonstrations in early August of tens of thousands of Chechens in support of the alleged killer of Russian war criminal Yuri Budanov, who raped and killed a Chechen girl in 2000, also showed that tensions and anger remain high in the republic, and are unlikely to subside.